With the new year, I do not like to make resolutions but this year is a little different. I have been trying to lose 75 pounds for about 100 years and decided to get serious about it last year. I had lost 25 pounds through diet and exercise and was really proud of myself. You can see some of my favorite work out DVD’s in my post on Effective Workout DVDs For Women. Then I fell in November and tore 4 ligaments in my foot and was in a cast for 3 months. When I fell, I did not know at the time I had also torn a rotator cuff in my right shoulder. So, after the case came off, I had to have my shoulder treated and ended up with surgery in August. I have not gained any of the weight I lost back, but I have not lost any either. Now I am cleared to do some walking and light aerobics and I am geared up to get that other 50 pounds off. I am going to follow a meal plan of healthy eating and I found this recipe for fajitas I wanted to try. 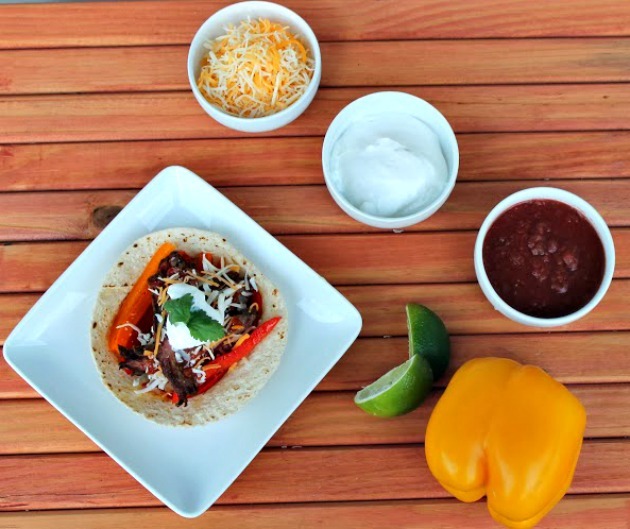 With a flour tortilla and the fixings, one fajita is about 350 calories. I can have one fajita, extra veggies, fat free sour cream and a whole wheat tortilla and I bring the calories down to around 300 calories and I am totally full. For the marinade, I used a product I was introduced to and I am absolutely in love with it. 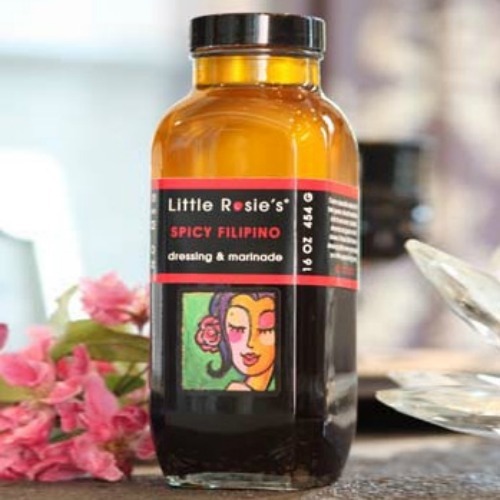 Little Rosie’s Filipino Dressings and Marinades will add a lovely kick to your meals like you have never encountered. If you are not familiar, Filipino food is a blend of Asian and Spanish foods which uses ingredients like red pepper, garlic, soy sauce and cider vinegar, just to name a few. You can use it to marinade beef, chicken, port or seafood or top your favorite salad as a dressings. They come in the traditional or spicy flavors and sells for $10 for each bottle and if you buy 6 bottles, you get free shipping! What favorite from the pantry or fridge do you use to add a little spicy kick to your meals? Easy to make and tangy twist on traditional fajitas. It look good. I want to try it. I like to add salsa, sriracha, and/or Trader Joe’s 21 Seasoning Salute spice mixture in a jar to my recipes. Those look delicious!! How spicy are they? My daughter would love that!! I normally do eat a lot of spicy food but my husbands adds jalapeño peppers to everything.